Translation: Translator Ian Nicholson /FR/. Revised by Renée Sporre-Willes, Raymond Triquet and Claude Guintard. Brief historical summary: Probably decending, like all mastiffs, from the Epirus and the Roman Empire molossers, relative of the Bulldog of Great Britain, the Alaunts (tribe of the Middle Ages), the mastiffs and small-type mastiffs of France. The bulldog we know is the product of different crossings done by enthusiastic breeders in the popular quarters of Paris in the 1880s. During that period, the Bulldog was a dog belonging to Parisian market porters, butchers and coachmen, it soon won over high society and the artistic world by its particular appearance and character. It rapidly became popular. The first breed club was founded in 1880 in Paris. 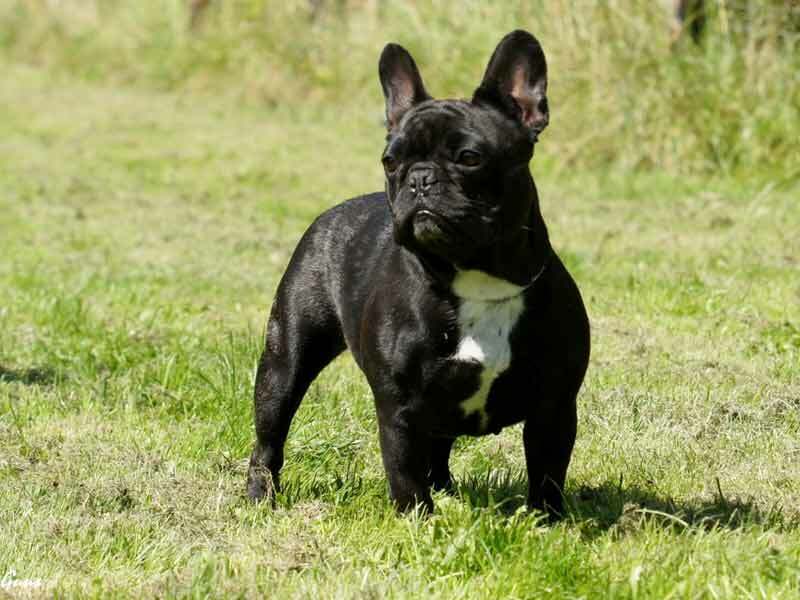 The first registration dates from 1885 and the first standard was established in 1898, the year in which the French Kennel Club recognized the French Bulldog breed. The first dog of this breed was shown at an exhibition as early as 1887. The standard, modified in 1931-1932 and 1948, was reformulated in 1986 by H.F. Reant with the collaboration of R. Triquet (F.C.I. publication 1987), then in 1994 by Violette Guillon (F.C.I. publication 1995) and in 2012 by the French Bulldog Club committee. Important proportions: The length of the body – between the point of the shoulder and the point of the buttocks – slightly surpasses the height at the withers. The length of muzzle is about 1/6 of the total length of the head. Behaviour / temperament: Sociable, lively, playful, possessive and keen companion dog. Head: Must be strong, broad and square, covered by the skin of the head which forms symmetrical folds and wrinkles, without excess. Skull: Broad, almost flat from ear to ear, domed forehead. Proeminent superciliary arches, separated by a particularly developed furrow between the eyes. The furrow must not extend onto the skull. External occipital protuberance is barely developed. Facial region: The head of the Bulldog is characterized by a shortening of the maxillary-nasal part as well as a slight to moderate slope of the nose backwards. The nose is slightly upturned (“snub nose”). Nose: Black, broad, snubbed, with symmetrical and well opened nostrils, slanting towards the rear. The slope of the nostrils as well as the upturned nose must, however, allow normal nasal breathing. Muzzle: Very short, broad, with concentric symmetrical folds. Lips: Thick, a little loose and black. The upper lip meets the lower lip at its middle, completely covering the teeth. The profile of the upper lip is descending and rounded. The tongue must never show when the dog is not excited. Jaws/Teeth: Broad and powerful. The lower jaw projects in front of the upper jaw and turns up. The arch of the lower incisors is rounded. The jaw must not show lateral deviation, or torsion. The gap between the incisors of the upper and the lower jaw should not be strictly delimited, the essential condition being that the upper and the lower lips meet to completely cover the teeth. The lower incisors surpass the upper incisors. Sufficiently developed incisives and canines. Complete bite is desirable. Eyes: Clearly visible eyes, striking with lively expression, set low, quite far from the nose and the ears, dark coloured, rather large, rounded, showing no trace of white (sclera) when the dog is looking straight forward. Rims of eyelids must be black. Ears: Medium size, wide at the base and rounded at the top. Set high on the head, but not too close together, carried erect. The ear is open towards the front. The skin must be fine and soft to the touch. Neck: Short, powerful, slightly arched, without dewlap, broadens towards the shoulder. Topline: Rising progressively, but not excessively, from the withers towards the loin. That conformation – also called roachback – is typical for the breed. Back: Broad and muscular, firm without slackness. Loin: Short, broad and arched. Chest: Cylindrical and well let down (slightly under the elbows); very well sprung ribs, so-called “barrel shaped”. Fore chest, broad and square-shaped, seen from the front. Underline and belly: Tucked up but not whippety. General appearance: Forelegs upright (and straight) seen in profile and from the front. Shoulder: Must be well laid back. Upper arm: Short, thick, muscular, slightly curved. Elbows: Close and tight to the body. Carpus (Wrist): Solid and short. Metacarpus (Pastern): Short and slightly oblique seen in profile. Forefeet: Round, compact, of small dimension, i.e. «cat feet», turning slightly outward. The toes are tight, nails short, thick and black. General appearance: The hindlegs are strong and muscular, a little longer than the forelegs, thus raising the hindquarters. The legs are upright as seen both in profile and from behind. Hock joint: Quite well let down, neither too angulated nor too straight. Tarsus : solid. Hind feet: Round, compact, turning neither inward nor outward. Gait / movement: The legs moving parallel to the median plane of the body, whether seen in front or in profile. Free, powerful and smooth movement. Hair: Smooth coat, close, glossy and soft, without undercoat. Colour: fawn, brindled or not, with or without white spotting. Brindle: Fawn coat moderately characterized by transversal dark brindling creating a ‘tiger-marked’ effect, strongly brindled coats must not cover out the fawn ground colour. A black mask may be present. Limited white spotting is admissible. Fawn: Solid coat, from light fawn to dark fawn, sometimes presenting a paler colouring of the inclined parts, with or without a black mask, although masked subjects are preferred. Sometimes accompanied by limited white spotting. Brindled with moderate or important white spotting: So-called ‘pied’, the spotting being ideally distributed over the entire subject. Some blotches on the skin are admissible. Fawn with moderate or important white spotting: So-called ‘fawn and white’, the spotting being ideally distributed over the entire dog. Some blotches of the skin are tolerated. The nose is always black, in all coat colours, never brown or blue. The allwhite subjects provided the edge of eyelids and nose are black – are admitted but not bred for, because of a risk of deafness. Height at the withers: Males: 27–35 cm. Females: 24–32 cm. A deviation of 1 cm above and below the standard is tolerated. Weight: Males: 9–14 kg. Females: 8–13 kg. 500 g more than the standard weight is allowed when the subject is typical. Strongly flecked with black brindle with white coat. Fawn and white coat strongly red speckled. In fawn coats, deep black trace extending along the spine. White stockings in brindles and fawns. Muzzle too long or excessively short. Tongue visible when mouth is closed. Horizontal topline from withers to loin. Excessive depigmentation of the lips, nose, eyelids, the rim of which should never be entirely depigmented. Lacks type: insufficient ethnic characteristics which result in the dog not really resembling other subjects of the breed. Torsion or lateral deviation of the jaw, resulting in the tongue constantly being visible. Dog with permanently visible canines (fangs), mouth being closed. Long, wired-haired or woolly coat. Colour not in accordance with what is prescribed in the standard, namely black, black with fawn markings (black and tan) and all dilutions of black with or without white spotting. Size and weight outside the standard limits. Only functionally and clinically healthy dogs, with breed typical conformation, should be used for breeding. The latest amendments are in bold characters.